Since lionfish are not native to the Atlantic, they have very few predators which caused their number to increase dramatically, especially through the South Florida Estuaries, the Gulf of Mexico and the Caribbean Sea. A lionfish can eat enormous quantities of juvenile fish: an estimation is that a single lionfish can reduce juvenile fish populations by 79% in just 5 weeks. They also reproduce rapidly, spawning every 4 days year-round and producing around two million buoyant gelatinous eggs per year. In the Indo-Pacific Oceans were lionfish are native, groupers, sharks and coronet fishes are known to prey on lionfish. In the Atlantic however, groupers are severely overfished and struggling to fill this role. Their growth in Caribbean waters is therefore difficult to control. But likely these hunting & eating practices are impractical and probably unsuccessful. So the only solution might be to let nature take care of itself, and hope that on the longer term the disturbed fish population will restore itself. Calling the lionfish invasion the 'greatest threat of our century' may be pushing the argument a bit to far ****. Such a statement seems more appropriate for the massive pollution and overfishing of our oceans. That COULD be one of the factors underlying this sudden invasion of Pterois. In areas were sharks are abundant such as the Bahamas and Honduras, sharks may switch to a different menu, and start eating the lionfish, even when it comes second to their favorite natural dish. For instance if the lionfish are outnumbering the native species in their territories. 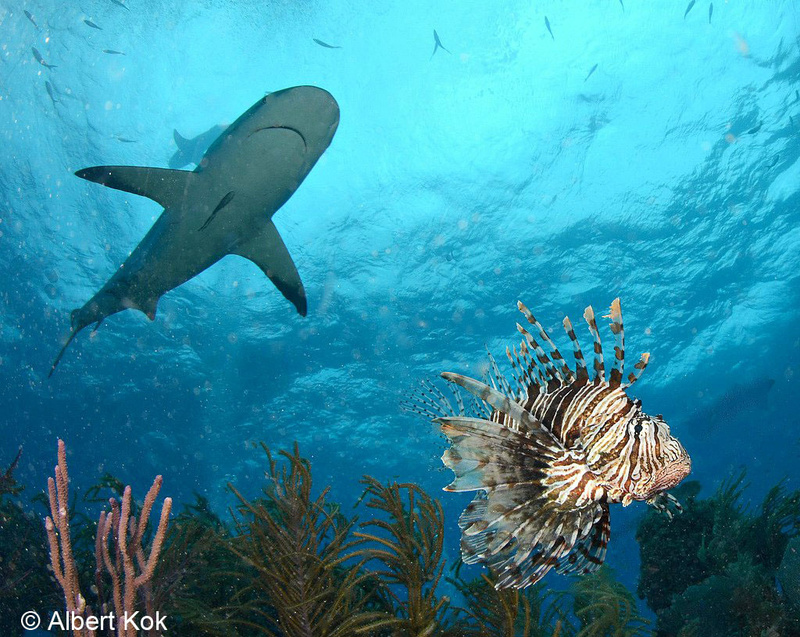 In Roatan Marine Park of the coast of Honduras divemasters are now even training sharks to hunt lionfish, with moderate success. *** Finally, a comeback of other large predators like the Nassau and Goliath groupers in the Western Atlantic could also help to bring the lionfish population down to acceptable proportions. Lionfish invasion in the Mediterranean? Mediterranean seawater temperatures are steadily increasing, and alien species are spreading, causing community shifts and tropicalization. Alien species have mainly invaded the eastern basin of the Mediterranean, probably through the Suez canal. **** Recent enlargement of the canal coupled with sea surface warming is raising concerns that this problem will get worse. Examples of some alien species are the pufferfish (Lagocephalus sceleratus) and the Lionfish (Pterois Miles). P. miles was first recorded in 1991 off Israel, but recently seems to have now colonised almost the entire south eastern coast of Cyprus in a period of only one year. Both species feed on local species in the Meditarranean taking advantage of their naiveté, and may threathen its biodiversity in the coming years. The pufferfish eats the economically important Sepia officinalis and Octopus vulgaris. One hopes that native groupers such as Epinephelus marginatus will learn to prey on lionfish and control their invasion.